The Omni Corpus Christi is in the lively downtown Marina district across from Corpus Christi Bay. It is the only full-service hotel in the area and only AAA Four Diamond hotel in Corpus Christi. The Omni offers a number of restaurants and recreational activities. Most guest rooms offer spectacular views of the gulf. High speed internet access is available in public areas. The hotel features an outdoor heated swimming pool as well as complimentary fitness area and a full service salon. It also offers a day spa and indoor racquetball courts plus casual as well as fine dining restaurants. The hotel is ideally located for guests interested in water sports such as sailing and swimming plus snorkeling and some of the best deep-sea fishing in the world. The hotel is just 15 minutes from Corpus Christi International Airport via complimentary airport shuttle service. Luxury that is surprisingly sensible. Hotel is 100 percent non-smoking. Republic of Texas Bar and Grill: Located 20 floors above the city the Republic of Texas Bar and Grill offers the finest steaks and freshest seafood and free range game dishes along with spectacular views of the city. Reservations are recommended. Open Mon-Sat from 1730-2230 hours and Sunday from 1730-2100 hours. Glass Pavilion Restaurant: This restaurant offers a wide variety of delicious delights including steak and seafood as well as pasta. Restaurant is open daily from 0630-1030 hours and 1100-1400 hours then 1700-2200 hours. Topsider Lounge: Located on the second floor, the Topsider Lounge is perfect for a quiet drink and relaxing conversation. Open daily from 1100-2300 hours. Morsels: Morsels is located in the lobby gift shops. Morsels is the perfect spot to jump start a morning with a wide variety of coffees plus cappuccino or espresso or also enjoy the snacks ranging from bagels to sandwiches. Open daily from 0600-2100 hours. Welcome to Omni Hotels and Resorts. 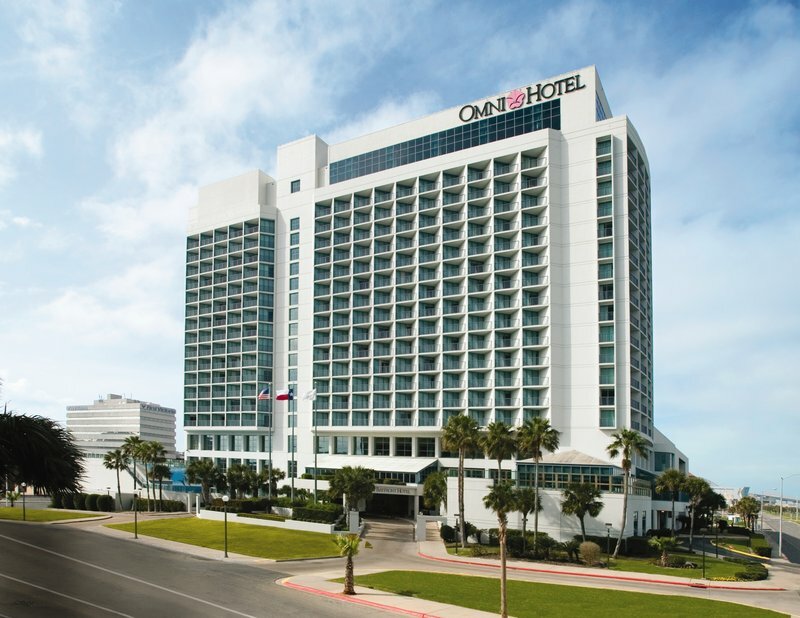 The Omni Corpus Christi Hotel is located in the lively downtown Marina District across from the Bay and offers spectacular views of the Corpus Christi Bay. There are virtually limitless choices for water sports including year-round sailing and swimming plus snorkeling and some of the best deep-sea fishing in the world. All are just moments away from this spectacular Corpus Christi hotel. Located just 15 minutes from Corpus Christi International Airport. Corpus Christi International AirportComplimentary airport shuttle service is provided to and from the hotel. The shuttle departs from the hotel at the top of every hour. Guests should meet driver in hotel lobby. Driver checks flight schedules and makes presence known. Arriving guests will find shuttle outside baggage claim area. City CenterHotel is 1 block from City Center.